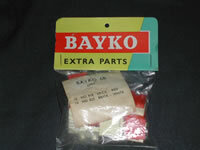 Detailed below are the complete parts lists, and other details, for the BAYKO Retail Packs from the MECCANO era. I hope you find this both interesting and useful. MECCANO general products order form. Surprisingly, even though it was approaching 3 years after the take-over, they were being offered to retailers alongside residual Plimpton era stock! The $ and € exchange rates [above] were last updated on December 1st, 2018. Retail Packs were sold from a plastic-covered wire 'Dispenser' [left] which was available “FREE on loan” to any shop ordering ten of each of the six different Retail Packs. …click here to find out more about the Display Units. I would guess that pack #6B was the best seller as they seem to be the most difficult ones to find. A small word of caution, it could be that modern collectors found these 'more plunderable' for their personal building stock. If you've any idea why the packs were designated 1B [as distinct from 1 or 1A] I'd be interested to hear from you. The most likely explanation is to avoid clashing with another MECCANO product - but which? with any information you may have. An announcement on page 31 of the March, 1964 'Toy Trader and Hobby & Model Stockist', a leading publication for the U.K. toy trade, suggests that new packs of BAYKO accessories would be available, however, sadly, these never materialised. Click here to find out more about this announcement. 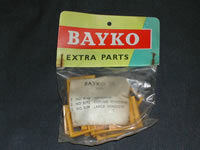 It's almost certain these packs survived until BAYKO's death - they were certainly present in the February, 1966 MECCANO Products Order Form. …click here for more on this leaflet. Click on any of the highlighted pack numbers below [e.g. #2B] to see a photo of the pack. Click on any of the highlighted pack numbers above [e.g. #2B] to see a photo of the pack.